This 2001 report examines global markets for clean energy and prospects for developing a competitive, export-oriented clean energy industry in the Pacific Northwest. Prospects for establishing leadership in the development, manufacture and distribution of clean energy technologies and related services are explored. Although there are potential synergies with increasing local clean energy supplies, an important objective in its own right, this analysis focuses on the unique opportunities, challenges and benefits associated with building industry leadership along the lines of the Danish wind turbine industry. Download the report. 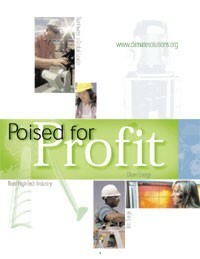 The Poised for Profit II project (2003), follow-on research for the first Poised for Profit report, produced a series of reports containing critical information for investors, entrepreneurs and policymakers. These reports include research and analysis to pinpoint the largest and best opportunities; surveys of investor and utility plans; and directories to research reports, related companies and helpful resources.